It’s not an overstatement to say that Terminator 2: Judgment Day is one of the most important movies of all-time. That title is earned, not only because the movie still stands as one of the greatest action films ever made, but because it changed the way movies are made forever. Before T2, you would have to look back to the Star Wars original trilogy and Godfather Part II to find sequels that critics and audiences both hailed as surpassing their original. “Sequel” was a radioactive word in Hollywood, and T2 is one of the main films that helped to change than and (for better and worse) brought the modern trend of franchising to the fore. T2 also was a landmark film in terms of F/X. Love him or hate him, when Jim Cameron makes a movie, he changes Hollywood. T2 introduced “morphing”, a CGI technique that simply takes a series of images and makes them flow together in a liquid manner. 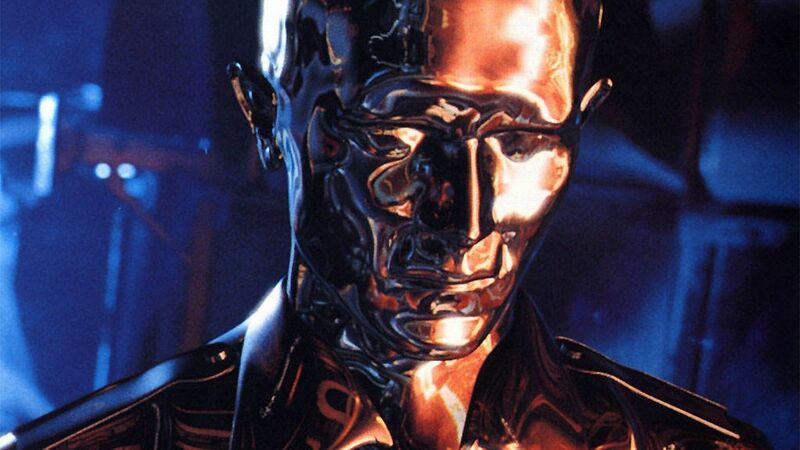 In the film, it was used to give the T-1000 (Robert Patrick) his ability to morph into different people and shapes, giving the Terminator a whole range of new abilities and making the T-800 (Arnold Schwarzenegger) an antique. Within three years, the technology was so widespread it was in shaving cream commercials. It’s one of the fundamental building blocks of CGI entertainment and T2 is where it originated. Like the best landmark F/X films, though, T2 in no way appears dated and Cameron’s blend of practical effects with his new technology is the reason the film won more Oscars than that year’s Best Picture (Silence of the Lambs). Picking ONE scene from T2 is almost impossible. It really is a flawless movie (one I look forward to further dissecting when it comes up on the IMDB 250 countdown). I chose the Highway chase after the T-1000 acquires John Connor at The Galleria and begins to chase him motorbike vs. tractor trailer, down an aqueduct until the T-800 on a Harley intervenes. It’s a fantastic action sequence, pivotal in the film, but it also shows how Cameron combined the practical effects from the vehicles with the unforgettable shot of the liquid metal terminator walking out of the flames and turning slowly back into Robert Patrick. 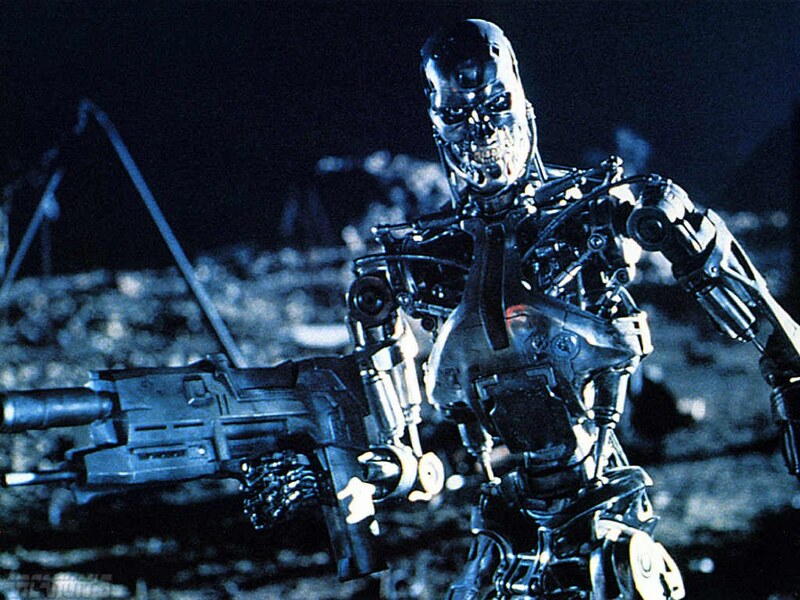 If Terminator: Genisys is half the film this is, the franchise will be back on track. Grown men were crying at the end, yet my grandmother loved the film and was cheering at the action parts. My GRANDMOTHER. Up was down and black was white, yet all was right with the world. In the interest of keeping you honest, I need to point out that the morphing technology was first used in Willow. It would be lot cooler if T2 had been the first film, but sadly no. Only Cameron, however, could have come up with the obvious yet brilliant idea of showcasing the technology by simply inventing a character who had the ability to morph. No, we’re both forgetting the water tentacle in the Abyss. That movie is still Cameron’s masterpiece, BTW. OK HE PERFECTED IT IN T2!!!! Arrrrgh lol. And NO, dude, the Abyss falls into the Abyss at the end. Cameron’s masterpiece is THIS film. Actually, I would argue that his real masterpiece is True Lies. If the Abyss isn’t better than T2, it’s just as good. There’s something about it. The darkness and the atmosphere, the sense of being trapped underwater, and those etherial alien beings. If you’re listening, James, I’m waiting for that widescreen transfer. Unfortunately, he’s got to find a new composer for Avatar 2 and 3, which is what Jamers Horner was working on when he passed.